By Keith Cowing on December 15, 2012 9:37 AM. "China's official news agency is reporting that the country's Chang'e 2 deep-space probe made an amazing flyby of the asteroid Toutatis this week, snapping a series of pictures as it passed just 2 miles away. The achievement signals China's entry into yet another exclusive space club. Only four of the world's space efforts have managed close encounters with asteroids: NASA (with NEAR Shoemaker and Dawn, for example), the European Space Agency (with Rosetta), Japan (with Hayabusa) -- and now China with Toutatis." 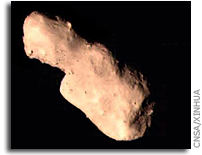 China's Chang'e-2 Does Close Flyby of Asteroid Toutatis (with image), CNSA\n\nNew milestone for China: Probe snaps close-ups of asteroid Toutatis, MSNBC\n\n\"China's official news agency is reporting that the country's Chang'e 2 deep-space probe made an amazing flyby of the asteroid Toutatis this week, snapping a series of pictures as it passed just 2 miles away. The achievement signals China's entry into yet another exclusive space club. Only four of the world's space efforts have managed close encounters with asteroids: NASA (with NEAR Shoemaker and Dawn, for example), the European Space Agency (with Rosetta), Japan (with Hayabusa) -- and now China with Toutatis.\"
This page contains a single entry by Keith Cowing published on December 15, 2012 9:37 AM. Another NASA JSC Holiday Video (Much Better) was the previous entry in this blog. Smallsats on the Rise is the next entry in this blog.